For the treatment and control of adult and immature roundworms, lungworms and bots. Does not treat tapeworms, use Eqvalan Duo for tapeworm treatment. Safe for use in pregnant mares and young foals. Each syringe treats up to 600kg bodyweight. Foals should be treated initially at 6 to 8 weeks of age and then every 8 weeks until they are 18 months old. Older horses should be treated every 8 to 10 weeks if required . 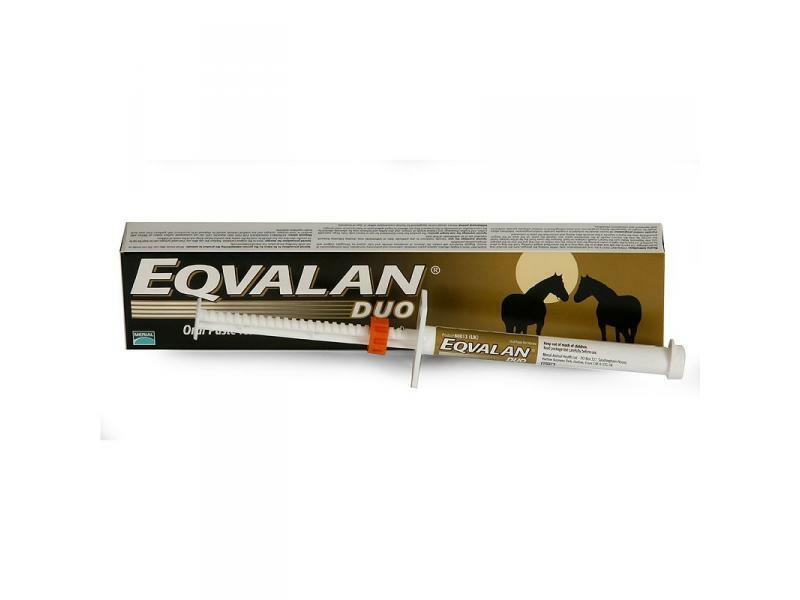 Eqvalan Duo Horse Wormer contains 1.55% ivermectin and 7.75 praziquantel in each syringe. For the treatment and control of tapeworms, large and small strongyles, hairworms, pinworms, roundworms(ascarids), neck threadworms, intestinal threadworms, large-mouth stomach worms, bots, lungworms and cutaneous onchocerchiasis in horses. Ensure you dose correctly according to your horse's bodyweight, if you are unsure of your horse's weight see our guide. Below are some recent questions we've received regarding Eqvalan Horse Wormer, including answers from our team. It is suggested that Pyrantel based wormers such as Pyratape P should be given at double the normal dose to treat for tapeworm. 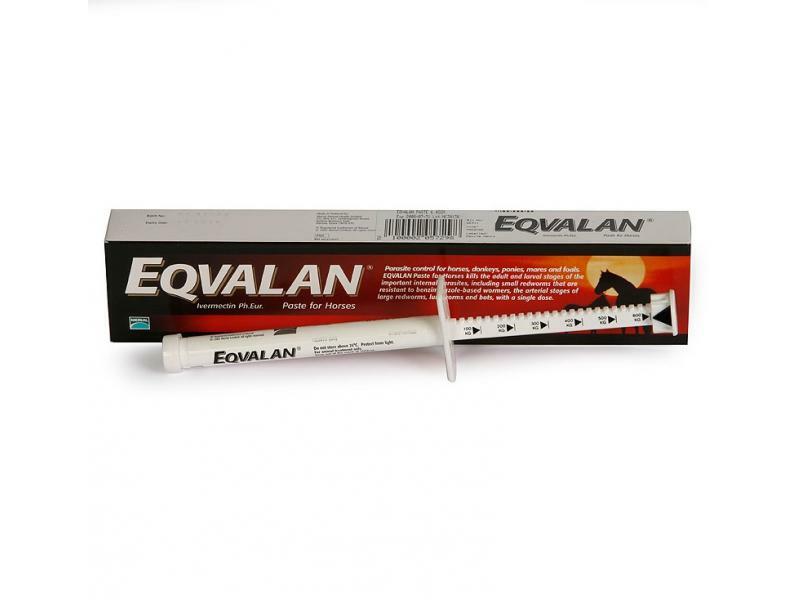 However the active ingredient against tapeworm in Eqvalan Duo is Praziquantel which does not require double dosing. Is the Duo wormer safe for mares due to foal in 2 months time? Yes Eqvalan Duo is fine to give to mares in foal after the first 3 months of pregnancy- not because it is unsafe but due to lack of clinical data in early pregnancy. Eqvalan is effective against bots. It is also a very different type of wormer to Strongid P and so it is fine to use again after just 1 week. What worms do these kill? What worms do these kill? Which ones are most important? Eqvalan will kill both adult an immature stages of many types of worms (a full list can be found on the data sheet in our description section) but there are two main groups we need to target- roundworms (nematodes) and tapeworms (cestodes). Roundworms include ascarids which most horses develop a good immunity to before in their first few years but have the potential to be very damaging in the first year of life, so routine worming is vital for the young animals. Of two types of redworm, large strongyles are now rare and do not often cause a problem as they are easily controlled. Small redworm (cyathostomes) on the other hand are much more difficult to control and may cause severe colic in spring as their larvae emerge from their dormant phase in the lining of the gut. It is important to target these larvae in winter months or early spring. The L3 'hibernating' or 'encysted' larvae are resistant to most wormers but when they emerge, the L4 stage larvae are killed by the ivermectin in Eqvalan. Eqvalan also remove pinworm infestations. We would advise sending off regular dung samples for egg counts, as worming when it is not needed promotes development of resistance in the roundworms. You should also be certain of your horse's weight, and a weigh tape is a simple way to calculate this. Eqvalan Duo also contains praziquantel to kill tapeworms such as A.perfoliata. It is considered okay to routinely treat for tapeworm in spring and autumn with Evalan Duo. Please can you tell me the difference between the two wormers and when I should use them? Eqvalan contains ivermectin, which is effective against all roundworm including L4 stage encysted small redworm larvae (they hide in the gut wall and emerge in spring, causing colic if infestation is high). Ivermectin is also effective against botfly larvae 'bots'. 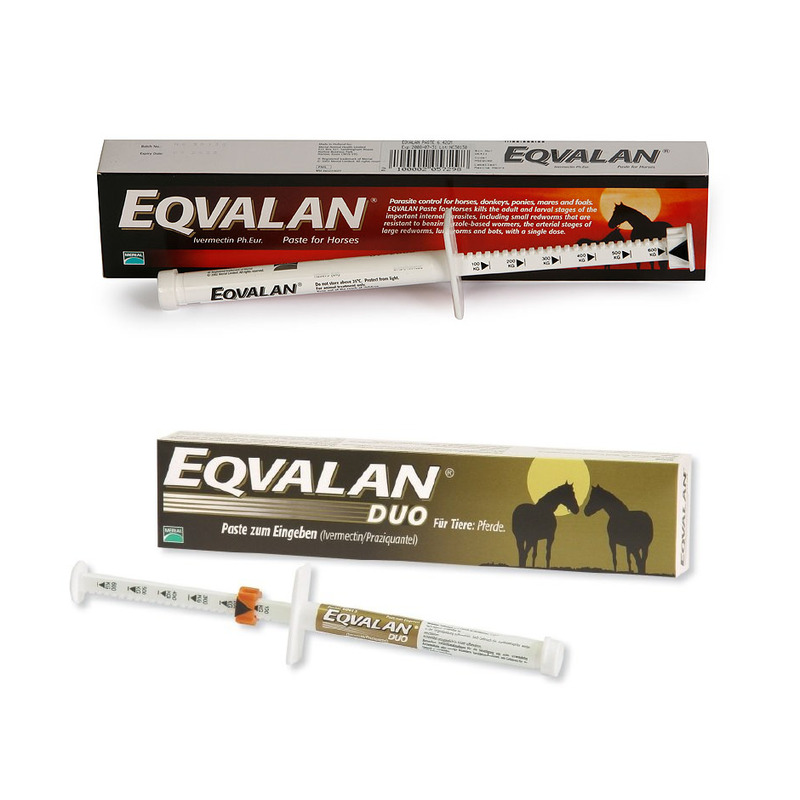 Eqvalan Duo contains ivermectin AND praziquantel to target tapeworms as well as all roundworms and bots. 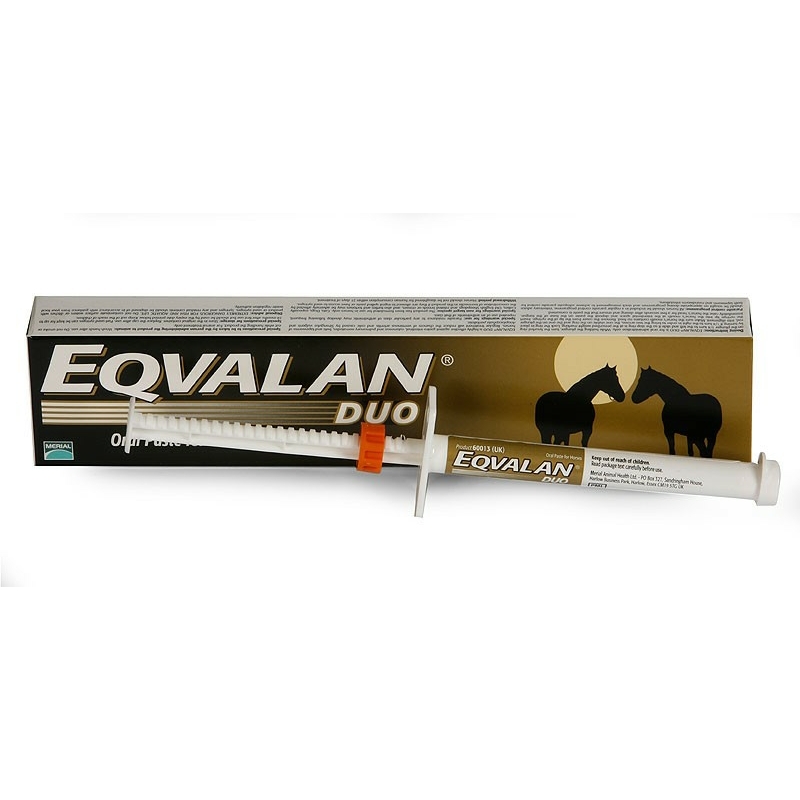 Eqvalan Duo should be used in spring (March/April) and autumn (September/October) to kill any tapeworm present among other worms and bots. 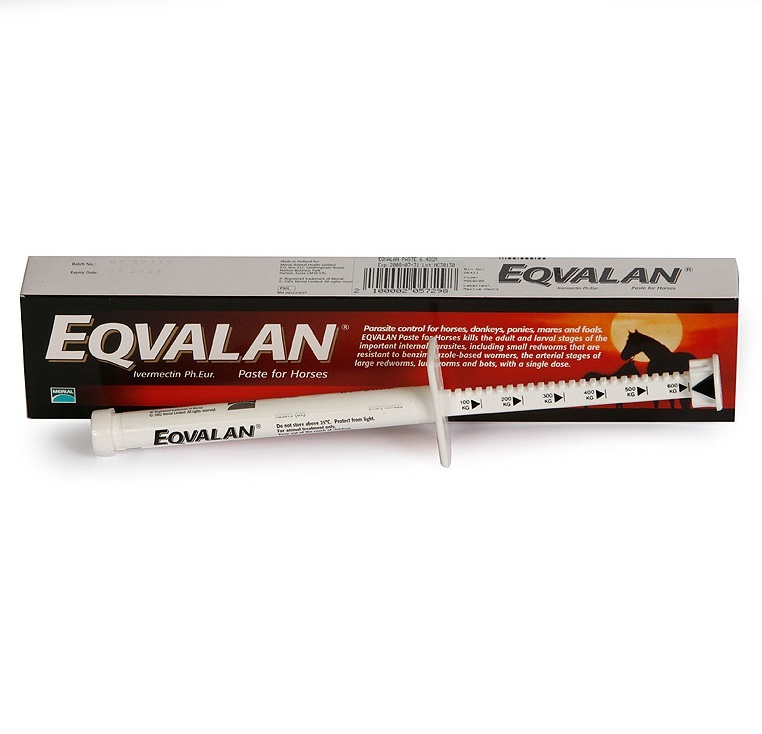 Eqvalan is ideal for targeted worming in winter (November to February) to rid the horse of immature larvae, bots and roundworm and for strategic worming in the summer months (May-August) if required -indicated by a worm egg count. Strategic worming involves sending off dung samples for an egg count, and only worming if the results indicate the horse has a high burden of worms. Horses naturally have immunity to some worms and a low level of infection is 'normal'.